Last Halloween, a terrorist driving a rental truck plowed into bicyclists and pedestrians on the Greenway bike path along the West Side Highway near Battery Park. In his act of terror, Sayfullo Saipov killed 8 people and injured 13 others after he entered the bike path North of Chambers Street and drove 14 blocks down the path, striking bicyclists and pedestrians on his way. The police were able to stop him after he slammed into a school bus at the Chambers Street intersection and tried to run away on foot. According to the authorities, Saipov was inspired by the Islamic Sate group when he committed his act of terror. He is now behind bars and held without bail. He pleaded not guilty but the federal prosecutors announced on Friday that they are seeking the death penalty which is extremely rare in New York. The last time it occurred was in 1953 for Julius and Ethel Rosenberg. Our firm represents most of the victims of the terror attack and while this decision by the federal prosecutors will satisfy the families of the victims it will never make up for their losses. 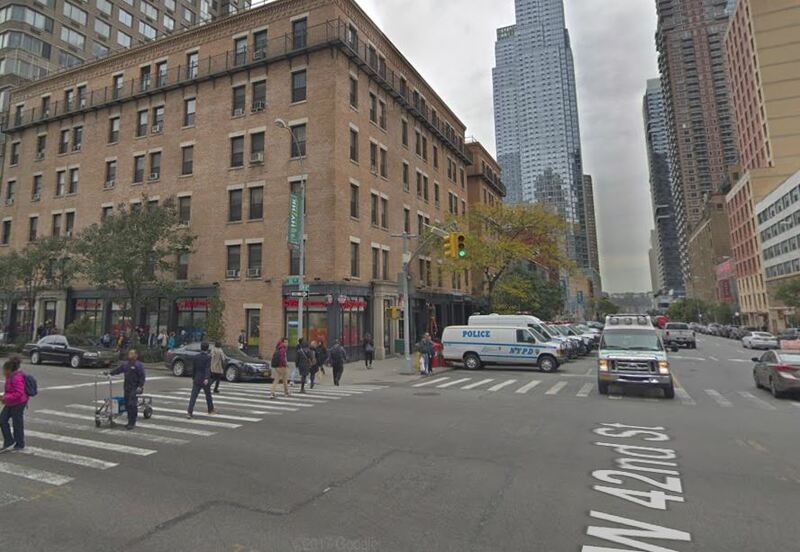 A pedestrian was injured after being ran over by a NYPD tow truck last Thursday around noon at the intersection of 42nd Street and 10th Ave. The elderly man was walking with a cane in the middle of the crosswalk on 42nd street when he was run over by a NYPD tow truck that was making a left turn from 10th Avenue onto 42nd Street. The pedestrian had the green light. According to witnesses, the driver of the tow truck wasn’t paying attention to the road and didn’t yield to pedestrians. She made a very sharp turn while there were still people in the crosswalk and she didn’t even realize that she hit someone. A witness told the Gothamist “she was driving like crazy”. After pedestrians screamed at her, the tow truck driver stopped near the scene of the accident but never left the truck to check on the unconscious man. She remained inside the truck while she was questioned by traffic supervisors. A 23 year old Australian tourist was killed in a bicycle accident in New York on Friday afternoon. Madison Jane Lyden and another tourist were riding their bicycles North on Central Park West. As they passed by the bus stop between 66th and 67th Street, the young woman was forced into traffic to avoid an Uber car pulling into the bike lane. According to witnesses she “bounced off” the garbage truck before landing under its wheels. She was rushed to the hospital where she died shortly later. Madison Jane Lyden was from Victoria Australia. She worked at a recreational center as a swim instructor, life guard and receptionist. She was visiting New York with friends. 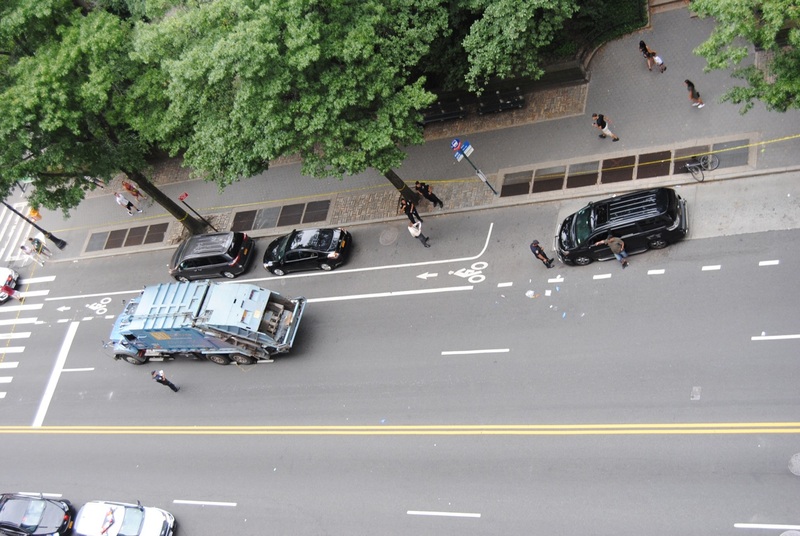 One of our employees happened to be visiting someone in the building located right across the street from the accident scene and took a picture from above that clearly shows the livery car pulling into the bike lane, on the left are the belongings of the victim on the ground. It also shows the Garbage Truck stopped at a significant distance from where it contacted the bicyclist. Skid marks , which would indicate the truck braked prior to contact are are not visible south of or next to the Uber in the photo. Last week a pedestrian was critically injured in a truck accident in New York. The 37 year old man was run over by a tractor trailer at the intersection of Amsterdam Avenue and 81st Street last Thursday evening a little bit before 7:00 pm. He was rushed to the hospital with severe trauma and was likely to die according to media. It was a busy summer night in a residential neighborhood and people were having dinner in the various restaurants and terraces located in the area. Witnesses eating at a nearby restaurant said they heard a big thump and then they saw the man laying face down in the street and not moving. Witnesses rushed to the victim to try to help while the truck continued on its way. He stopped one block away from the accident after a crowd gathered at the rear end of his truck. The driver then cooperated with the the police He told them that he he didn’t realize he had hit someone. 5,569 people suffered personal injury in 20,551 traffic accidents in New York City last May. Among them were 2,534 motorists, 1,755 passengers, 430 cyclists and 850 pedestrians. While looking at past statistics, we notice a seasonal factor that causes the number of crash injuries to always increase during the month of May compared to the previous months of February, March and April. Last May the auto accident injuries in New York City increased to a record number. In May 2013, before Vision Zero, 4,988 people suffered injuries in NYC crashes. Then the Vision Zero program started and the number of crash injuries declined to 4,621 in May 2014. It increased again slightly to 4,788 in May 2015 but stayed below the Pre-Vision Zero number of injuries recorded in May 2013. In May 2016, it peaked above 5000 and never went back below that level for the last 3 years. 5,415 crash injuries were recorded in May 2016 and 5,314 in May 2017. Sanitation Salvage, one of the biggest New York trash haulers has a history of fatal accidents. The company was all over the news recently after one of their truck drivers killed two people in less than 6 months and lied about one of the person he killed pretending it was a homeless man while it was an off-the book worker. Propublica and Voice of America took an in depth look at how the company is running its business and they recently published the result of their investigation. Thankfully nobody was injured or killed in another NYC accident involving a garbage truck belonging to a private company. On Saturday morning, 40 year old Anthony Castaldo was drunk behind the wheel of his garbage truck. He was driving on 60th Street between 19th Street and 20th Street in Borough Park, Brooklyn, when he lost control of his vehicle, slammed into 8 cars, then a tree before ending up in the front yard of a private property. He tried to run away on foot but he was quickly caught by the police. He was charged with leaving the scene of an accident, drunken and reckless driving and resisting arrest. Castaldo was immediately suspended by his employer, Viking Sanitation, a private company with a garage in Bath Beach. A month ago, a 78 year old woman had her leg crushed by a private garbage truck in Brooklyn (see previous blog). Two month ago a pedestrian was killed by another private garbage truck driver. The driver had killed another person with his truck 6 months before but was still behind the wheel (see previous blog). Private carting companies are responsible for the deaths of 43 pedestrians between 2010 and 2017. They have a terrible reputation, forcing drivers to work extended hours and cover large geographical zones. How many innocent people will still suffer terrible injuries or die until the City does something to strengthen the regulations for these reckless companies? A pickup truck crashed into a MTA bus injuring 13 bus passengers in the Bronx, NYC. The crash occurred on Friday afternoon around 1:20 pm. 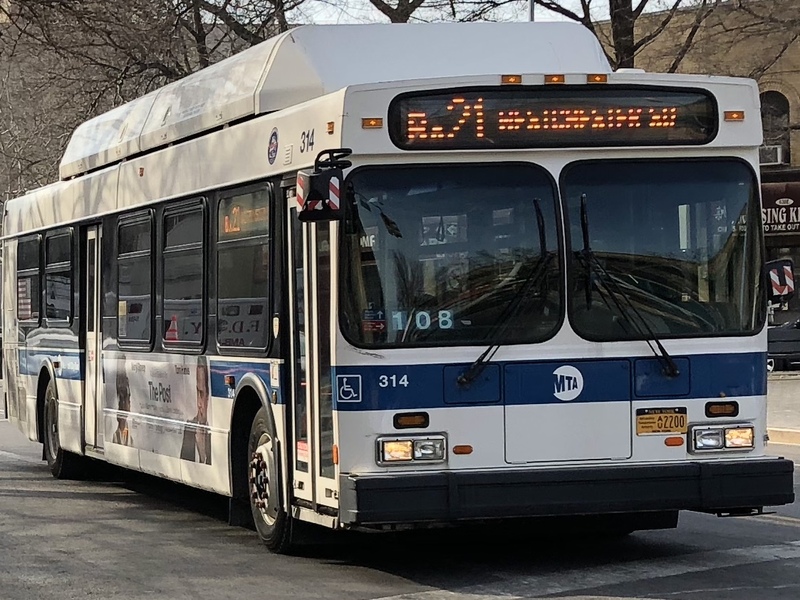 25 passengers were on board of the Bx21 MTA bus. As it was making a stop at E. 180th St and Morris Park Ave, it got rear-ended by a pickup truck. The impact was so intense that 13 bus passengers suffered personal injury. 11 passengers were transported to the hospital to be treated. Among them, 6 were seriously injured. Two other passengers who were also injured refused medical attention. The driver suffered from lower back pain. The police are still investigating the cause of the accident. The pickup driver wasn’t arrested. A private garbage truck struck and seriously injured a 78 year old woman who was crossing the street yesterday in New York City . The hauling truck that belongs to MIST Entreprise was making a left turn from East Fourth Street onto 18th Ave in Kensington, Brooklyn, when it hit the pedestrian. The accident occurred around 11:00 am. Witnesses saw the victim being pinned under the wheel of the truck. She was screaming and her leg was completely mangled. The 78 year old woman was rushed to the hospital with serious injuries. The driver of the truck stayed at the scene of the accident and so far hasn’t been charged. The truck that crashed into the pedestrian has a history of reckless driving. According to city records, over the last two years, the truck was cited 5 times for running red lights. Privater garbage truck haulers have a very bad reputation in New York City. Drivers are forced to drive long hours and cover large routes, making them prone to reckless driving. Between 2010 and 2017, 43 New Yorkers died after being struck by private carting companies’garbage trucks. Organized labor believes that the Business Integrity Commission that regulates them is not doing enough to prevent this carnage. Not even a month ago another elderly resident from the Bronx was fatally struck by a private garbage truck. Police investigated the accident and discovered that the driver had previously fatally ran over a colleague with his truck 6 months before. He lied to the police about it and was still allowed to drive without being charged. (see previous blog). 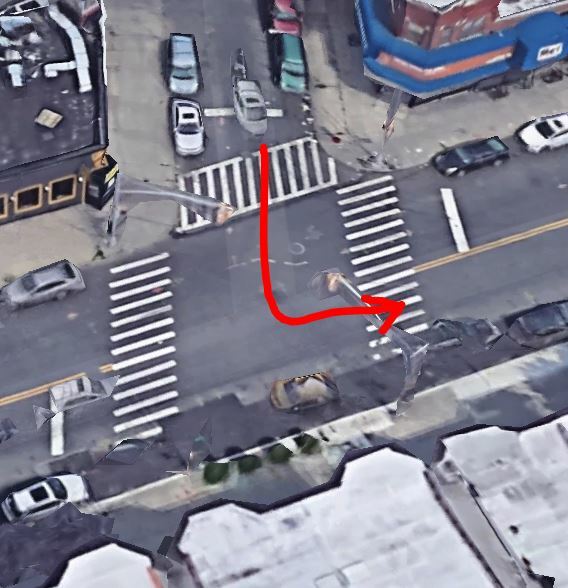 In a previous post we mentioned that a pedestrian was fatally struck by a garbage truck belonging to Sanitation Salvage two weeks ago in the Bronx. Leon Clark, a man in his 70ies who was living in Adams Houses was walking on E. 152nd St. near Jackson Ave in Morrisiana when he was fatally struck by a private garbage truck driven by 33 year old Sean Spence. It is the second time in less than 6 months that Spence killed a pedestrian while driving his truck. On November 7, Spence was driving his truck when he fatally ran over 21 year old Mouctar Diallo, an off-the books employee who was helping him. Diallo was standing on the the steps leading to the passenger’s door when he lost his grip, fell under the truck’s rear wheels and died. Spence initially lied to the police and claimed that the victim was a crazy homeless man who tried to jumped on the side of his truck.